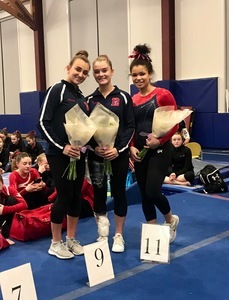 The Darien YMCA gymnastics team continued the tradition of honoring their former teammate by smiling their way through a sweep of the team titles at the Emily Fedorko Challenge. Coach Nicole Kapitan began each meet session by reading an inspiring tribute to the memory of Emily Fedorko and encouraged everyone to have fun during the meet as Emily would have done. 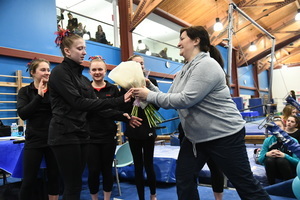 Graduating senior gymnasts Gianna Cardini, Lily Fairleigh, Kelsey Fedorko and Kaitlyn Moussignac were also recognized with flowers at the conclusion of their final home meet. Five squads also swept the All-Around(AA) titles for their Level, beginning with the Level 4 team, which placed first by nearly five points. 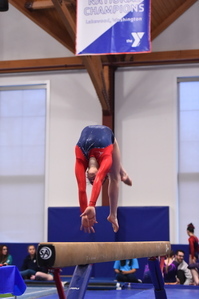 Jacquelyn Coppola started the scoring by taking first on four events including AA with an impressive 37.60 in the 8-9 age group and second on beam. Eve Calio placed third on vault, bars, AA and beam where she tied Taylor Davies and also tied Davies for fourth on floor. Violet Peroni scored second on vault and bars, third on floor and fourth AA. Anna Rogers earned her meet high score on beam. Avery Hanson topped the podium on four events in the 10s group, including a 37.65 AA and was second on vault. Molly Zengo was the vault champ and was third on bars and second on all other events and AA. Lily Royce scored third on beam and fifth on beam, floor and AA. Katie Cutler had a full house in the 11s group, winning vault, floor and the AA with 37.35 and placing second on bars and beam. Shayna Moeller swung to a huge 9.85 to win bars and was second on floor, fourth on beam and third AA. Tanner Shanley placed fourth on beam, seventh AA, eighth on bars and floor and tied Hannah Dudek for sixth on vault. Dudek was also sixth on bars and beam. Annabel Clas swung to fifth on bars and placed sixth on floor, seventh on beam and eighth on vault and AA. Rhea Rai earned eighth on beam and third on vault where Kaia Woodman was seventh. 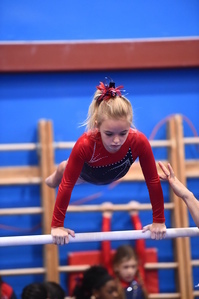 Emma Bookless joined her teammates in winning four titles in the 12s group, including a huge 37.75 AA and was second on vault. Ingrid Kerr tumbled to third on floor and was fifth on bars and fourth on vault and AA. Jahnavi Orr was steady for second on beam and fourth on floor. In the 13 and up group, Brook Wallace was champ on bars, beam and AA with 36.75 as well as fourth on vault and tied Olivea Rosenbaum for second on floor. Rosenbaum was the vault champ and was second on all other events and AA. The first place Level 7 squad also swept the AA titles, starting with Julia Decsi in the 11-12 group, who scored 37.5 AA and also placed first on beam and floor, third on bars and tied Lauren Smith for second on vault. Smith was also second on beam and third AA. Anna Altier soared to the vault title with 9.65 and was third on floor and second on bars and AA. Sofia Alarcon-Frias earned third on beam and second on floor, while Natalie Solis made the most of competing on only one event due to injury, winning the bars title with 9.3. Abigail O’Brien had two pair in the 13-14 group with firsts on bars and AA with a huge 37.90, seconds on beam and floor and a third on vault. Kristie Alianiello and Emma Kelly tied for second on both bars and vault and Kelly also tied Melina Cardini for third on beam. Kelly was also sixth on floor and fourth AA. Alianiello scored fourth on beam, third on floor and second AA. Cardini was also fifth on vault. Anna Primmer soared to the vault title with 9.6 along with third on bars, fifth on beam and sixth AA. Lana Schmidt captured four titles in the 15 and up group including the AA with 36.35 and was sixth on bars. Megan Cutler placed second AA and was third on vault, fourth on beam and tied Emma Neaderland for fifth on bars and third on floor. Neaderland was also third on beam and AA. Kerry McDermott scored fifth on vault and seventh on bars, beam and AA. Lucy Collins took second on vault and sixth on floor. Senior Lily Fairleigh was the bars champ with 9.0 in her last home meet. The Level 8 squad won the team championship by nearly eleven points along with sweeping the AA titles. Nadia Borja set the pace, winning bars, beam and AA with 37.55 in the Junior group and placing second on floor and third on vault. Sofia DeStefano vaulted to first with 9.3 and was second on bars, beam and AA and tied Abigail Nevin for third on floor. Nevin was also third on bars. Anna Moss vaulted to second and was third on beam and AA. Sarah Cross earned her meet high score on floor. In the Senior group, Sofia Iuteri was champ on bars and AA with 36.90 and placed third on beam and floor and tied Saskia Chermayeff and senior Kaitlyn Moussignac for fourth on vault. Chermayeff was also sixth on beam and floor, fourth AA and tied Tori Ware for second on bars. Ware also placed sixth on vault, third AA and second on beam and floor where she tied Olivia Perkins. Perkins also earned fifth on vault and bars where she tied Leilani Nguyen. Nguyen topped the podium on vault and floor with 9.5 and 9.45 and was fifth AA. Bella DeStefano earned third on vault and sixth on bars. Seniors Kelsey Fedorko and Gianna Cardini completed their last home meet in style, with Fedorko taking first on all events and AA with 36.25 and Cardini sweeping second with 34.45 AA. Wells Fischer, the sole level 10 competitor, had a highlight meet, scoring 9.55 on beam, 9.4 on floor and a huge 37.15 AA. The Level 3 squad won a tightly fought battle for the team championship by just over a point. Sidney Ogilvie set the pace, winning all four events and AA with 36.40 in the 7s age group. Elsa Keehlwetter scored second on bars and third on all other events and AA. In the 8s group, Sabina Molnar was second on bars, first on beam, floor and AA with 37.5 and tied Katie Jack for third on vault. Jack was also third on bars, second on beam and fourth AA. Alina Khilko had two pair, placing third on beam and floor and sixth on bars and AA. Olivia Castellanos was the vault champ with 9.4 and was fifth on bars. Tory Brupbacher was fourth on floor and second on vault where Elena Yoon was fourth. Audrey Zuniga earned her meet high score on floor. Heili Jalakas earned second on beam, third AA, seventh on bars and fourth on vault and floor in the 9s group. Kate Whitticom had two pair, placing fourth on beam and AA and sixth on vault and bars along with third on floor. Chloe Sherman vaulted to third and was fourth on bars and sixth on floor and AA. Izzy Djiounas was steady for sixth on beam. Morgan Wise was champ on beam, floor and AA with 37.40 in the 10s group and was second on vault and fifth on bars. Nicole Recinos scored fifth on vault, second on bars, sixth on floor and third on beam and AA. Carrie Coughlin swung to ninth on bars and was fourth on beam, fifth AA and third on vault and floor where Isabelle Noel was eighth. Reese Barrett captured four titles including the AA with a huge 38.00 and placed second on bars in the 11s group. Evelin Arreguin swung to third on bars and was sixth on vault, floor and AA. Elise DeGennaro was sixth on beam and seventh on floor while Sloane Kosowsky earned her meet high score on vault. The Level 5 squad won the team title by a five point margin. Leading the scoring was Kayla Koproski in the 9-10 group, where she took first on bars, floor and AA with an impressive 37.95 and was second on vault and beam. Emily Rizzi was champ on vault and beam with 9.8 and 9.55 and placed fourth on floor and second on bars and AA. Tess Hennigan had four thirds on vault, bars, beam and AA and was second on floor. Ava Telgheder earned fourth on beam and AA while Olivia Davis earned her meet high score on beam. In the 11s group, Stella Nehro and Hannah Bitsky tied for first on vault and floor with 9.75 and 9.15. Nehro was also third on bars, fourth on beam and second AA. Bitsky was also third on beam and fourth AA. Mina Leon swung to second on bars, earned third on vault, floor and AA and tied Elsa Del Bene for sixth on beam. Del Bene was also fourth on bars. Katie Primmer vaulted to fourth, was fifth on beam and sixth on bars and AA. Madeleine McGivney flipped to sixth on floor. Reilly Costello topped the podium on beam, floor and AA with 37.20 in the 12s group and was second on vault and bars. Bella Koproski soared to 9.85 to win vault, placed fifth on bars and second on all other events and AA. Alexia Buchesky took third on vault, fifth on beam and fourth on floor and AA. Annelise Enters had a pair of sixths on vault and floor. Chloe Sernick was champ on beam and AA in the 13 and up group and second on bars and floor while Mia Macdonald scored third on beam. The team champ Level 6 squad was paced by Alexa Bell in the 12-13 group, where she took first on vault, floor and AA with a terrific 37.80 and was second on beam. Tanner Generoso was the beam champ with 9.7, placed sixth on bars and second on vault, AA and floor where she tied Ali Kolman. Kolman was also fifth on vault, second on bars and third on beam and AA. Ava Licata scored sixth on floor, fourth on vault and beam and fifth on bars and AA. Penelope Arredondo earned fourth on floor and third on bars where Sophia Geffner earned her meet high score. In the 14 and up group, Alex Decsi soared to 9.5 to win the bars title and Sommer Schmidt vaulted to fifth. In the 10-11 group, Ellie Davies was the floor champ with 9.55, placed third on vault and second on all other events and AA. Sophie Root never wavered in winning beam with 9.5 and was second on vault and third AA. Emily McKee swung to third on bars. The team will compete next at the YMCA State Championships in Wilton. All photos credit to Team Photo except senior trio.